1 of 2 Heat an outdoor grill to medium. 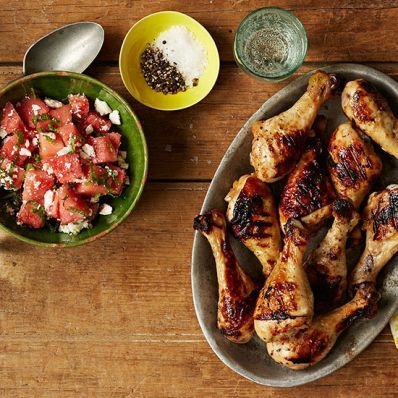 2 of 2 Remove drumsticks from marinade (discard marinade). Arrange drumsticks on grill over a medium flame and cook for 15 minutes, rotating every 3 minutes or so, until internal temperature reaches 165 degrees and juices run clear. 1 of 1 In a large bowl, toss watermelon cubes with mint and feta. Serve with chicken.